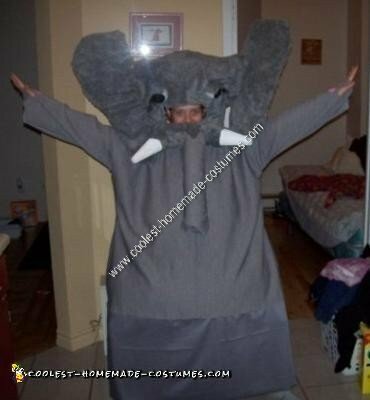 I wanted to have a large, grey bum for Halloween so my husband and I created this elephant costume for the big night. 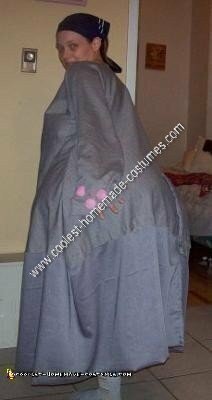 It started with a fat suit from a Big Bertha costume, then a large, grey homemade dress with pink paw pads and a tail with the fuzzy black tip. The head was constructed from a hard hat, blocks of Styrofoam, child’s butterfly wings for ears, grey fuzzy material and LOTS if glue, two way tape, contact cement, straight pins—you name it and it is holding this head together. Styrofoam balls and broom bristles made the eyes and eyelashes. A small dryer tube and material made the trunk.